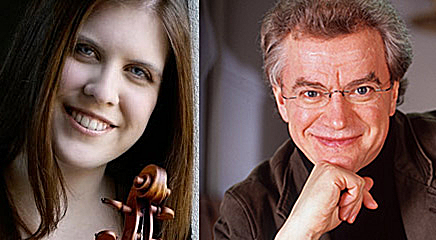 Heartwarming news for the holidays from two members of the Minnesota Orchestra: According to their personal Facebook accounts, Music Director Osmo Vänskä and Concertmaster Erin Keefe are engaged to be married. We look forward to hearing more beautiful music from the Minnesota Orchestra in the coming year. Our next Minnesota Orchestra broadcast is Friday, Jan. 16, at 8 p.m., when Vänskä conducts a Future Classics concert. Music is an integral part of the gaming experience. Even though the first game, Pong, didn’t have music, it wasn’t long before every on-screen adventure had its own soundtrack. In the early days, composers had access to two or three channels that could each produce one sound at a time. As a result, a lot of early scores end up simulating Baroque-era figured bass and early counterpoint. Eventually, gaming technologies caught up with present day. Now, gamers are treated to full orchestral scores, depending on the game itself. Consistently, I’m surprised and in awe of the talented composers who are writing soundtracks for video games. For instance, Gustaf Grefberg’s score for Brothers: A Tale of Two Sons is captivating. Grefberg, an unknown quantity to me until I heard this score, works for a Swedish game developer called Starbreeze Studios. For the Brothers soundtrack, he mimicked an old Scandinavian singing tradition called “kulning”, used primarily by women to call back the herds at the end of each day. Grefberg’s kulning is used to great effect, in a game about family and loss. Peter McConnell wrote a terrific score to Broken Age, demonstrating his love of Stravinsky’s The Rite of Spring at a moment in the game involving a fairytale-esque sacrifice. McConnell’s instrumentation is always a delight  his scores demand musicianship from the performers. The fandom for video game music is deep and wide. Lately, a handful of string quartet projects have popped up in celebration of that fandom. The Videri String Quartet formed recently in the Boston area, and a project called The String Arcade recorded a string quartet album of game music to raise money for an El Sistema-based after-school program in California. As always, it’s a pleasure to share this music with you, and I look forward to bringing you more in the future! I’m picky about them, though, with regards to where I’m willing to ink my own body for eternity. Also, no colors. But that’s just me. If you want colors in your tattoo, knock yourself out. I’ve immortalized a favorite game and two favorite friends (one feline, one human). I have some silly tattoos I got when I was too young to know what to get (but most eyes will never see those). For the last year, I’ve known I wanted another. I was convinced it would pay homage to another game. I figured I’d get a Mass Effect tattoo. But nothing grabbed me. Nothing hit me like a bolt of obvious lightning. Until last week. I was flipping through the pages of John Eliot Gardiner’s new book on Johann Sebastian Bach. I don’t claim to have a “special relationship” with Bach – no more or less than most can claim. But I do claim that no composer means more to me. Not Beethoven, not Rameau, not Stravinsky. Not Brahms, and not Mozart. Bach. So I got his signature. 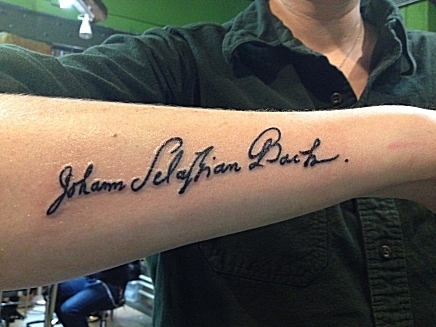 At least, I really hope it’s his signature, and not, like, Mendelssohn, signing Bach’s name. So JSB got some real estate on my arm last night, and I couldn’t be more thrilled. Special thanks to the crew at Leviticus Tattoo on Lake Street for their work. Also, I beg you, don’t tell my mother. The Composer Conversation Series is for music lovers of all stripes, and features some of today’s most original, prominent and prestigious voices in composition. The events are free, but the Saint Paul Chamber Orchestra’s Matt Thueson records them and puts them on YouTube. Here is video of the first Conversation in the series, in which I talk with composer John Harbison about his music and career. It was magnificent to learn so much about him and his music. Enjoy! Enjoy this representation of musical notation by cats, from a Tumblr blog called “Trumpet Angst”. I was there Saturday afternoon for the 2:00 performance. It seemed like half of Classical MPR was there. I guess the other half was there that night for the 8:00 show. These were the final performances of the musicians of the Minnesota Orchestra with Osmo Vänskä at the helm. First of all, I have a pretty great job. I get to talk about classical music all the time. On top of that, I get to do a music-appreciation show, and a show about video-game music. And I used to work regularly with the Minnesota Orchestra. Before the lockout, Classical MPR broadcast the Minnesota Orchestra subscription concerts live Friday nights. A major component of those broadcasts included interview clips from the conductor (whether it was Osmo or a guest) and the soloist. Although Brian Newhouse hosted those broadcasts, I did the interviews in advance, usually on Wednesdays or Thursdays. List any accomplishment of my career, and this was my favorite task. I loved going to Orchestra Hall each week or so. And while it is thrilling to speak to the likes of Andrew Litton, Jean-Yves Thibaudet or Midori, it was always a delight to speak with Osmo. Every time I pulled up to Orchestra Hall, it felt like Christmas day. I got to walk in the stage door, where some of the best musicians in the world hung out. Sometimes, I got to listen to them rehearse. I never would’ve made it to Orchestra Hall as a trumpet player, but somehow, I’d managed to get there without my instrument. The first time I met Osmo, it was clear why he and the musicians of the Minnesota Orchestra have such a love affair. I could see the fondness  and respect  he has for them in his eyes, and I could hear it in his voice. He spoke with equal warmth about the music. And then you saw them onstage together. Conductor and orchestra. They danced the most beautiful dance only an orchestra can create. They played as if they wanted to impress each other, but in the way you want to impress someone you love dearly by making them breakfast in bed or bringing them flowers. The word ‘impress’ isn’t even the right word  it was more like an eagerness to share. The best of friends  the kind of friendship that feels like family. It’s why I’ve wept over this loss. Many of us have. It’s unbearable to imagine how the musicians and Osmo feel. For nine years, it was a dream come true. We’ll miss you, Osmo. Thank you for coming here. It took me a while to find the last word for that ‘headline’. The word ‘disaster’ seems histrionic, but only in a larger context of tragic world events. In terms of American orchestras, and the larger culture of orchestral music, it is, indeed, a disaster. There is no shortage of editorial fallout from the events over the last year, especially since Maestro Osmo Vanska announced his resignation from Minnesota Orchestra early Tuesday morning. One such article surfaced overnight Wednesday, from Ivan Hewett, a writer for The Telegraph. The title alone, “US orchestras are greedy and overpaid“, is incendiary. Now let me tell you why, even if Ivan Hewett is right, he is wrong. It does not matter if it’s true. It just doesn’t. We’ve created a culture in America where musicians have the potential to be rewarded well for their tens of thousands of hours in a practice room. And at that, it’s a small, hand-picked number of musicians who are rewarded as such, in a small number of orchestras in the country. These players are the best of the best. And all most of us want is to be paid, or compensated, for our skills and talents. Yet we never miss a chance to freak out whenever someone gets paid a lot of money. There are plenty of job fields where people are rewarded more for less. Executives and managers all around the world are grossly overpaid, probably in your own place of work. And what, exactly, does the public receive from their over-compensation? Not much. Yet, when I hear the Minnesota Orchestra, I’m treated to aural magic. I used to be, anyway. Similarly, there are just as many occupations in which people are paid far too little for doing so much, like nursing, teaching or social work. Even veterinarians earn far less than human doctors. And vets save a whole lotta lives, too. Can we stop quibbling about how much these folks make, or used to make, or might potentially make? The fact remains that this is the orchestral culture of America. Just because it’s different in the UK doesn’t mean it’s wrong. It just is. I’ve had some songs stuck in my head (ear worms) the past several days, including one of my favorite pieces by Schumann, and it occurred to me that the weather might have something to do with it. Probably not, but my ear worms coincidentally fit the season really well. Saturday morning, I woke up with the Flower Duet in my head. No clue why, but it was there the entire day. If you’re impatient or short on time, the most famous part starts at about 1:17. Great music for an end of summer day. Sunday belonged to Robert Schumann. He wrote several collections of small pieces, and he’d put them in albums like Scenes from Childhood, or Album for the Young, or Colored Leaves. The piece that stole my ears Sunday came from Albumblätter, or Album Leaves, and it’s called “Wiegenliedchen”, or “Cradle Song”. I’m a particular fan of this performance, because Schumann marks the music Nicht schnell, which means “not fast”. It makes it easier to hear the beautiful unfolding counterpoint. Monday, I couldn’t get Josef Strauss out of my head. I’m a huuuuuuuge fan of the Strauss family. Reminder: Richard Strauss is not a part of that family. The Strauss fam includes Johann Sr. and Jr., Eduard and Josef. So Josef’s awesome waltz called Austrian Village Swallows (or Dorfschwalben aus Österreich) was running over and over in my head. By the way, it’s really fun to clean house to waltzes. What music accompanies your autumn? Head here to learn about (and hear portions of) MIT professor Tod Machover’s crowd-sourced symphony; it debuts at the Edinburgh International Festival, which looks like an amazing way to spend late summer. The CBC has a program called The Signature Series, created by Paolo PietroPaolo. It’s an interesting discussion about key signatures. If you visit SoundCloud, you can hear some of the audio. Key signatures have significant meanings, and while much of that might be lost as a result of equal-temperament, it’s legitimate to consider the characteristics of pieces based on their key. Didn’t mean to nerd out about that, but it’s true. Check it out. If you have time today (22 August 2013), please head to Google’s homepage to see today’s Google Doodle. It’s quite beautiful to watch and hear! For more Debussy coverage, check out our Claude Debussy composer page.